Solar Powered Floating Classroom to be Commissioned! 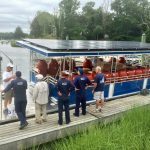 The Friends of Pleasant Bay (FOPB) with Pleasant Bay Community Boating (PBCB) have announced a commissioning ceremony for a solar-powered floating classroom research vessel, unique to Cape Cod. The private ceremony will take place on August 25 at PBCB’s direct waterfront campus, and is primarily an event to thank supporters of the project. The floating classroom research vessel (FCRV), named “Friend of Pleasant Bay,” is a 37’ long, 12’ wide, solar-powered electric-motor pontoon vessel that can accommodate up to 29 passengers and two crew. It can also accommodate 10 wheelchairs at reduced capacity. Solar panels on the vessel’s roof deliver power to the electric motors. The shallow draft of the FCRV will help students and scientists to access remote areas of the Bay and the near-silent electric motors will allow quiet approach to seals, birds and other wildlife that live on PleasantBay. Although a very few floating classroom research vessels exist on Cape Cod, a solar-powered floating research classroom vessel is a first. The idea for a FCRV was spawned at a meeting in 2017 among representatives from FOPB, PBCB, Center for Coastal Studies and Chatham Marconi Maritime Center. Taking the lead, FOPB researched floating classrooms, settled on a builder — American Pontoon in Manning, SC — and raised the funds to build the FCRV. The vessel was designed, with input from all its originators, specifically to meet the demands of education and research. Important early decisions were that the FCRV would be gifted to PBCB and that three to five years of maintenance costs would be included. PBCB has the facilities –- dock, water access, mooring – and experience with marine education programs and enrollment. Further decisions involved collaboration among the Monomoy and Nauset school systems, Lighthouse Charter School, Cape Cod Regional Technical School, Chatham Marconi Maritime Center and Center for Coastal Studies to ensure that use of the FCRV would be strictly educational and research-related. FOPB has also already made education grants to schools in Brewster, Chatham, Harwich and Orleans for over 32 floating classroom trips in the 2018-19 school year. The FCRV will serve as a dedicated research vessel for scientists, an educational platform for Cape Cod children, locals and visitors to the Cape and will be available to other organizations that are seeking a unique learning experience on Pleasant Bay.